I have never been so excited about a game that isn’t even scheduled to come out for another year. That’s right, I’m talking about Dragon Age Inquisition, the game formerly known as Dragon Age 3. I’m assuming this name change by BioWare is an attempt to separate the game from the crapwagon known as Dragon Age 2. Okay, I don’t really think the game was that bad, but it was not quite the worthy sequel to Dragon Age Origins. 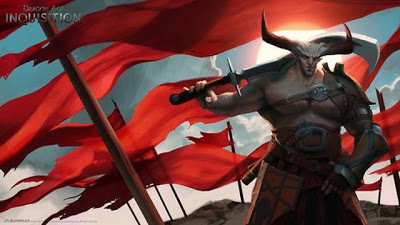 So here’s the real news, BioWare has recently announced that the Qunari will be a playable race in Dragon Age Inquisition! I kind of figured this would be true, because they hinted at this at E3, but now it is official news. I’ve been playing Dragon Age Origins on PC lately, and I’ve been using Sten every now and then just to see what I’ll be in for. Also, since I’m mentioning Dragon Age Origins on PC, BioWare has also confirmed that tactical mode is back. This time it will be on both PC and console. On PC, tactical mode is the ability to switch from regular third person view to overhead view (think Baldur’s Gate) and the capability to pause battles and assign your party members to specific mods and to use whatever spells/abilities you want them to use. This function was removed in Dragon Age 2 in favor of hack and slash combat, but BioWare has listened to fans and they are bringing it back. I use tactical mode religiously, and I’m probably going to wear out my space bar (the pause button) by the time I finish this game. Be sure to keep checking back, because I will religiously post any news I can find on Dragon Age. I CAN’T WAIT BUT I HAVE NO CHOICE! Previous Previous post: Does Anyone Really Need a Nintendo 2DS? Probably not! Next Next post: I Have To Buy Eight Controllers Now?